wireless networks can also be a problem in large old houses with thick walls, fireplaces, etc. Children need access to the internet for school homework and a single point of access can be difficult in terms of time when everybody needs access to the internet around the same time in the evening. 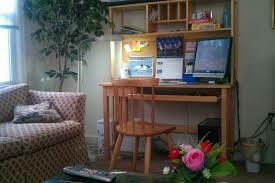 If the computer is in a shared area of your home then they may be distracted. Doing work surrounded by other distractions such as kids, TV, etc. is not ideal. 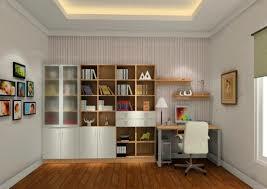 Better to have internet access in a study or other separate area. If you have a wired network point in a room you can also use this point for a telephone. It may not add much value to your sale price but it might tip the balance in favour of a sale if your buyers see that they don’t have to start wiring the house when they move in. While wireless networks and wireless phones are OK they can be a problem in larger properties and places where many homes are close together. In large properties, especially older ones with thick walls, wireless networks may not work well. Other things which can affect wireless reception are large metal objects such as fridges, filing cabinets etc. and microwaves, digital telephones and mobile telephone masts. Old technology wireless video equipment can also cause serious interference with your wireless network signal. In areas where many homes are close together such as towns and in lotissements the close proximity of other wireless networks can cause interference problems and lead to your computers losing their access to the internet. This can be a permanent loss or it may happen intermittently. 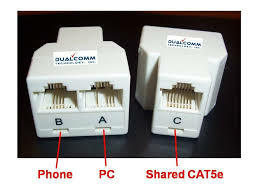 This is due to the wireless connector in the computer continuously looking for the best wireless signal and at times will choose your neighbours network and due to the fact that you don’t have their security details your internet connection will fail. You might be trying to use the same wireless channel as your neighbour, you might not even be able to see that there is a wireless signal interfering with yours as some wireless networks are set to not broadcast there name. 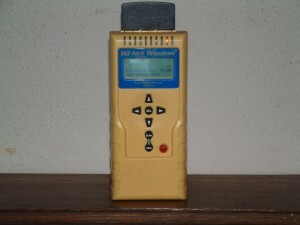 The only way to see them is by using a wireless network finder meter similar to the one in the image above.